Root canal treatment is needed when the blood supply or nerve of the tooth is infected through decay or injury. If pulp becomes infected, the infection may spread through the root canal system of the tooth.This may eventually lead to an abscess. An abscess is an inflamed area in which pus collects and can cause swelling of the tissues around the tooth. The symptoms of an abscess can range from a dull ache to severe pain and the tooth may be tender when you bite. 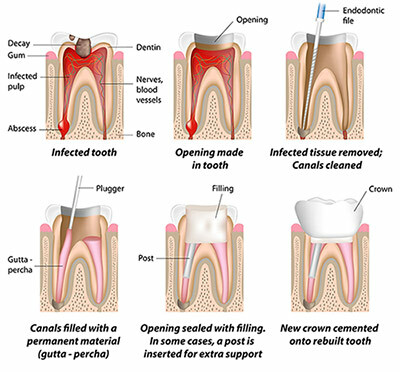 If root canal treatment is not carried out, the infection will spread and the tooth may need to be taken out. Root canal treatment does not hurt. Usually you will have a local anaesthetic and it should feel no different to having an ordinary filling done. At Healthy Roots, using advanced European technology, we can do most cases in a single visit. In case of abcess/ swelling of mouth, more than one visit may be required. There may be some tenderness afterwards but this should gradually get less over time. The aim of the treatment is to remove all infection from the root canal. The root is then cleaned and filled to prevent any further infection. Once the infection is cleared, the tooth is permanently filled. Root canal treatment is a skilled and time consuming procedure. After root canal treatment the tooth will be dead and may be more brittle. You may need a crown to give it extra support and strength. In the past, a root filled tooth would often darken after treatment. However, with modern techniques this does not usually happen. If there is any discoloration, there are several treatments available to restore the natural appearance. Root canal treatment is usually very successful. However, if the infection comes back the treatment may have to be repeated. The alternative is to have the tooth out. Once the pulp is destroyed, it can't heal. It is not wise to leave the infected tooth in the mouth, as it can lead to severe infection in the mouth.Although some people would prefer to have the tooth out, it is usually best to keep as many natural teeth as possible.